If you're like me and went into college thinking you'd loove 8am's (seriously, what was I thinking), then you're most likely having some trouble getting out of bed in the morning. I have dreaded 8 am classes every Monday, Wednesday and Friday this semester, so I can tell you from personal experience that they are pretty difficult to deal with. I've finally started to accept the fact that they won't get any better, and luckily I've come up with some ways to make them slightly less painful. I have somehow never fallen back asleep after my first alarm at 7, but I know plenty of people that have slept through both their 8 am's and 9 am's on a regular basis. To make sure this doesn't happen to you, I highly recommend setting multiple loud alarms to ensure you get up when you need to. I made the mistake of having to get everything into my bag while getting ready a few weeks ago, and I ended up forgetting my Spanish textbook for class. Needless to say, you'll sleep a lot better knowing everything is ready to go when you wake up. Belvita bars are my new obsession, and I have one sitting out every morning to grab and eat while I walk to class. As much as I would love to have the time to sit down and eat a big breakfast, I would much rather get the extra 15 minutes of sleep. Keep a stash of quick breakfasts to eat on your walk to class and it'll make life 100x easier. I personally am not one to nap because I always wake up super groggy, but everyone in college seems to swear by naps. Sammy informed me that 90 minutes are the perfect amount of time to get in some good rest, so if you find yourself falling asleep in the middle of the day, take an hour and a half to get in a quick snooze. 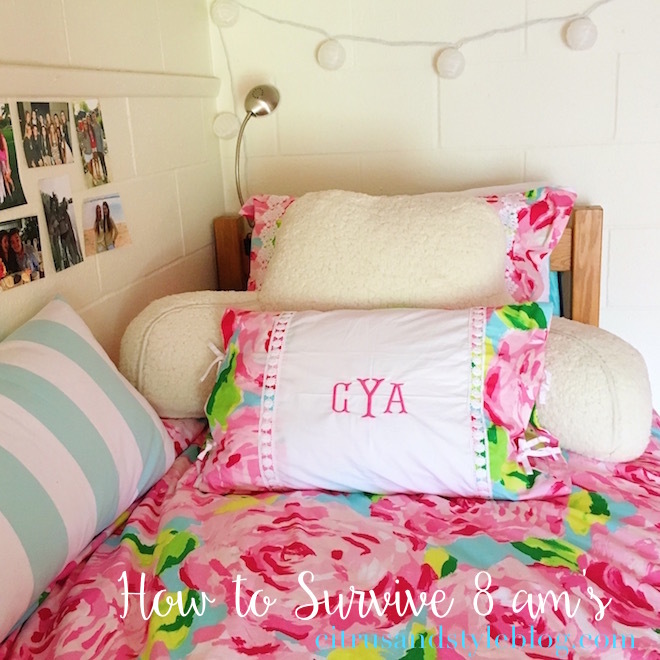 Any other tips for surviving 8 am classes? These tips are awesome, Caroline! As a high school senior, I will definitely be saving these for next year!